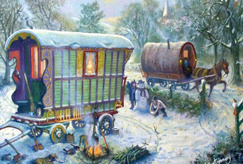 The Gypsy tradition goes back to the darkest reaches of time. It uses simple spells and rituals to harness the power of nature and of the elemental spirits that are all around us. The Gypsy people are as independent in thought as they are in other areas of life, and they don’t believe that a clergyman is really necessary to intercede between a person and the ‘powers that be’. Although most Romanies would profess a belief in the official religion of the country in which they reside, and indeed many are now born-again Christians, there is still a deep respect for the old ways. And why not, when everyday experience proves the efficacy of those ways? Everyone has the right and the ability to use the natural power of nature for themselves, though of course, as with everything else in life, some people are more talented than others. The more experienced a person is in the ways of the paranormal, the more confident and thus the more successful he will be come. The power should never be abused on trivialities, such as trying to impress others with your knowledge and ability, as this shows a complete lack of wisdom. 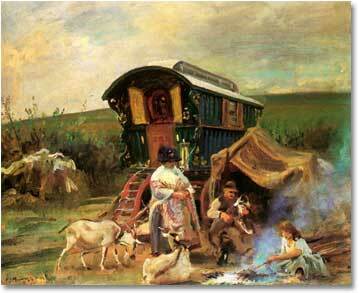 The Gypsy way is a way that springs from the heart, and the deepest, most primitive instincts of man. It respects nature and man’s place in nature. It teaches us to take joy in the moment. Ask any yes or no question, and Auntie Moss be givin' you an answer. The old witch woman is wiser than you think. Go ahead, give it a go.